Charismatic megafauna? This is just a pretentious way of saying large and awesome animals. Diving on the Great Barrier Reef you may be confronted by a variety of large animals, all of them exciting, some of them dangerous and the occasional one terrifying. Banner photo above: Giant Queensland grouper on a reef off Cooktown. Diver dwarfed by an eight metre whale shark. A large tiger shark in blue ocean water outside the reef. This large male is courting an even larger female that has lost her tail. Humpback whales are abundant reef visitors during winter months. These four metre dolphin-like whales are not often seen on the GBR. These large whaler sharks are usually seen on the front of northern outer-barrier reefs. A large aggregation of female green turtles around Raine Island on the far-north GBR. One of the most abundant sharks on the reef is the aggressive grey reef shark. 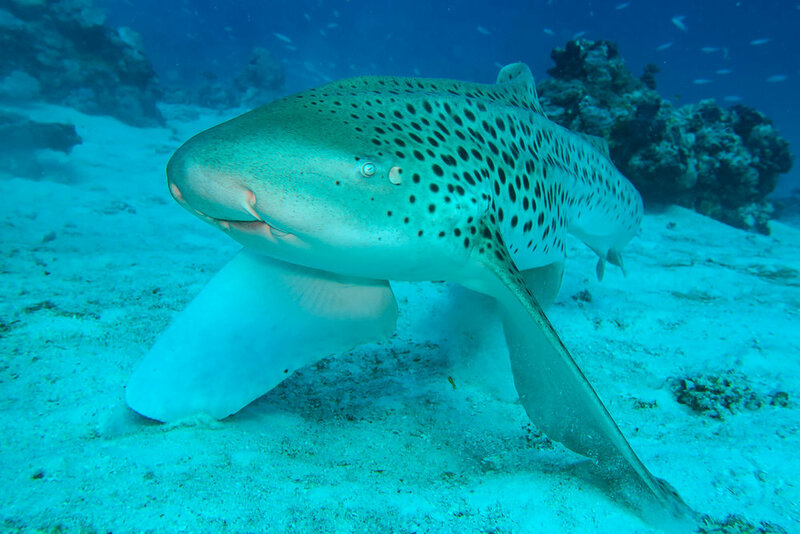 When adult the zebra shark has spots like a leopard but when young it has dark zebra-like stripes. The hawksbill turtle feeds on sponges and other invertebrate animals rather than algae and seagrass like the green turtle. This large male maori wrasse has become tame being fed at a tourist pontoon. Large potato cod are often found in passes through the northern outer barrier reefs. Bottlenose dolphins often bow-ride on boats but are rarely seen underwater on the GBR. Harmless manta rays are plankton feeders than may be up to five metres across. Whitetip reef sharks are common but almost completely harmless. Large bumped parrotfish have powerful jaws that can bite off chunks of the toughest coral. 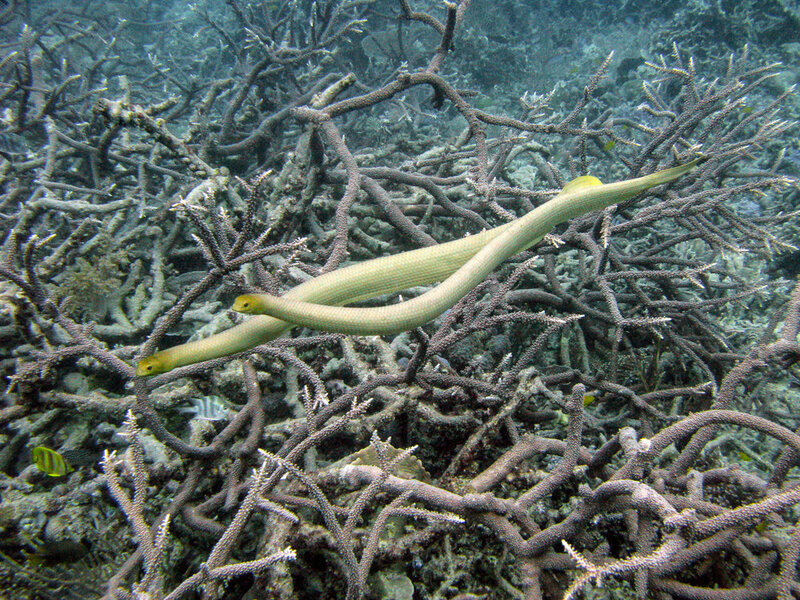 Pair of olive sea snakes chasing after a diver on the southern GBR. Dolphins and whales are often seen from the boat as we move between dive sites and are always welcomed with delight. When we are underwater, dolphins on the Great Barrier Reef are rare and elusive visitors, usually swimming quickly by with only a cursory look. Whales have visited us underwater on a few exciting occasions, sometimes making repeated passes. We have often been bathed in the incredibly powerful notes of the humpback whales’ songs, eyrie and moving sounds that vibrate your whole body. Some fishes grow large enough to be considered megafauna. Cods and groupers may reach more than a metre and a large grouper always raises adrenaline levels, especially when they yawn their mouths wide in an aggressive display. Maori wrasses often grow well over a metre and the large, hump-headed, green males are very impressive, although they are usually very wary. Bumphead parrotfish also reach over a metre and may gather in schools of over a hundred, an amazing sight in clear water. Manta rays, several metres from wingtip to wingtip, are sometimes seen, and are often curious. With slow motion flaps of their enormous wings they bank and dive gracefully around us, distracting us from our work for a while. And then there are sharks! Everyone asks about the sharks. On the Great Barrier Reef sharks are seen on most dives, usually harmless whitetip reef sharks up to about one and a half metres in length. Also common are the aggressive grey reef sharks, a solidly built whaler shark reaching two metres or so. These sharks can be very annoying, making fast, close approaches as they warn you not to interfere. Divers are sometimes bitten by these sharks; a single quick bite designed to frighten you away, but non-threatening behaviour usually calms them down before they reach that dangerous stage. Larger, more dangerous sharks are fortunately rare and their normal daylight behaviour towards divers is usually quite relaxed. Silvertip whalers, bull sharks and pigeye sharks (a large whaler very similar to the bull shark) may make one or two close passes before fading into the distance but their two to three metre size commands attention. Hammerheads and tiger sharks are at the top of the food chain, and always raise the pulse rate, not least because of their huge size. Hammerheads may reach five or six metres and tigers four to five metres. These are the sharks that are equipped to handle large prey and easily capable of eating you if they choose. However, their normal behaviour is quite benign as long as they are not excited by the smell of dead or dying fish. We have left the water on a few occasions because of worries about aggressive shark behaviour but with familiarity it is usually possible to act non-threateningly and cautiously go about your work. Closely related, but in a different category is the whale shark, the largest member of the shark family. This harmless species may grow to over 10 metres in length and is rarely seen. In 40 years of diving on the Barrier Reef we have only seen them underwater on a few memorable occasions. With their blunt snouts, vast tail and white-spotted pattern they make an unforgettable sight as they cruise effortlessly past. 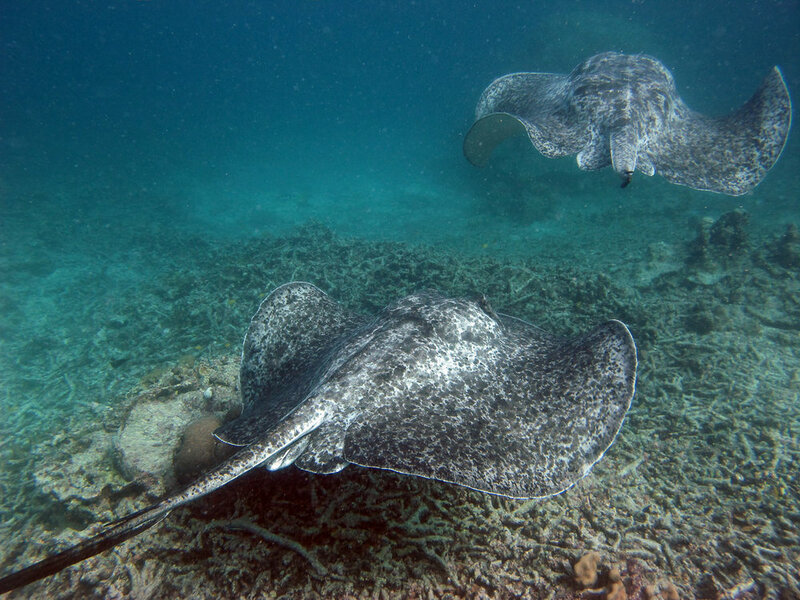 Some stingray species reach well over a metre across and make an exciting encounter, but in spite of the Steve Irwin tragedy they are rarely aggressive toward scuba divers. Sea snakes are found on many southern reefs, their venom many times more powerful than the most-deadly land snakes. Only the olive sea snake is common, a species that grows to about 1.2 metres long, but the rarer stokes sea snake may reach twice that length and can be quite intimidating. All sea snakes are attracted to movement and can swim faster than a diver but if you stay completely still they will lose interest and go about their business. It took us several years to become comfortable working around sea snakes but now they do not slow us down at all. Turtles are always exciting to see underwater. There are three well-known species on the Great Barrier Reef and these can be common in some locations, especially around their breeding sites. Above: Close encounter with a young green turtle, these animals can become tame around popular tourist sites.